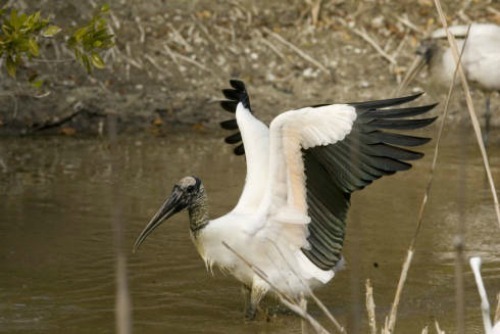 The wood stork is at least for now, a success story as part of the Endangered Species Act. The "at least" part is due to the fact that pythons have invaded the Everglades. Since pythons are semi-aquatic, and this wild bird species is a wading bird, it unfortunately feeds where the snakes hunt. The aggressive feeding habit of the invasive species snakes poses a serious threat to the rebounding numbers of this endangered bird and other Florida wildlife. 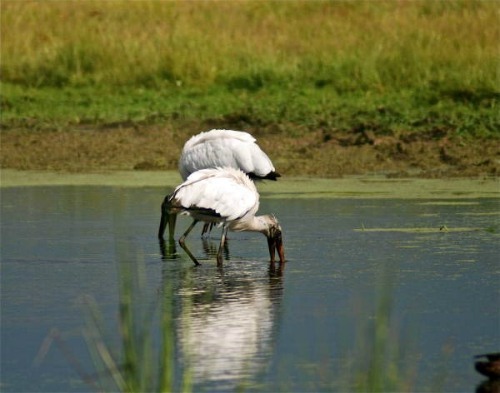 This is especially true since the Everglades National Park is this wading birds most common breeding ground. Currently this bird is found during the winter months in the Florida Keys and other parts of Florida, as well as Georgia and South Carolina. The same species is also found in Mexico and Northern Argentina and during the summer months birds from both locations migrate further north. The storks from Mexico migrate into the Louisiana, Alabama, Texas, Arkansas and Mississippi area while the storks from Florida move up the East Coast. It's rare, but it has occurred where this species has been reported in all 48 contiguous States and even into parts of Southern Canada. However, if something should happen where the birds from southern Florida become extinct, their chances of rebounding in the area again are slim, as the birds from Georgia and South Carolina are likely not to come further south. Plus the storks from Mexico and Argentina only migrate north out of breeding season, and Florida is not in their migratory path. This is also a rather unusual looking bird with it's dark gray to almost black bald head and neck. It has white feathers, and a black tail with black primary and secondary feathers trimming the wings. With it's bald head, and curved black bill it somewhat resembles an ibis, although it's larger, standing about 50 inches tall with a wing span of up to 65 inches. These wading birds also congregate in large numbers, and multiple nests are often seen in the same trees or on the same structures. This bird is also an excellent fisherman. Like other wading birds, they hunt in shallow water, slowly working their way along. However their technique is different, as they rely solely on touch, not sight to catch their 1" - 6" prey. As they slowly wade through the water they poke and probe with their bill. When they sense or touch a fish, they quickly snap their bills shut and swallow their meal. Small fish typically make up their diet, and since they live in large groups, an area that has a plentiful and reliable supply of small fish is crucial. This is one of the reasons this bird began to dwindle in numbers from the Everglades. 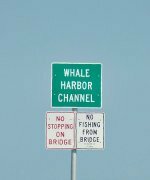 It's food source became unreliable and depleted when the water running into and through the Everglades began to be rerouted for canals, and irrigation projects. Flood gates and other water control mechanisms also severely affected the flow and path of the water channeling into the Everglades. These factors, combined with a severe drought over several years, affected the food supply and had adverse negative impact on the healthy life cycle of the storks. 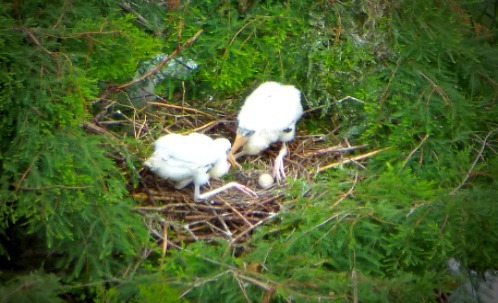 Wood storks will also travel great distances to feed. They have been documented traveling 80 miles or more just for the day. This adaptability may be one of their reasons they've managed to survive against the recent odds they've faced. One of their breeding areas in the Everglades National Park is at the lovely little lake called Paurotis Pond. To protect numerous breeding species, every January through to the end of May or until nesting is over, the Park closes down access to Paurotis. However, viewing is still possible from the parking area off of the main Park road. These birds start mating typically at age 4. In Southern Florida where it's warmer they mate and nest earlier. 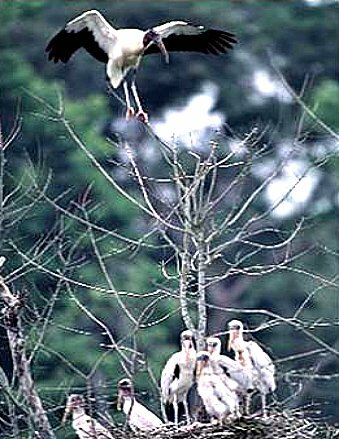 These storks mating season begins in October or a bit later, and fledglings are seen beginning February and March. The birds typically lay 2 - 5 eggs in large woody nests that are higher up in cypress trees and mangroves, with both parents participating in the incubation process. Like other storks that are comfortable nesting in human structures, these are no different and nests will appear wherever opportunity presents itself. The python danger not withstanding, this bird has made a very dramatic comeback. By 1995 it's numbers had dwindled to approximately 500 mating pair. By 2012, their numbers are estimated in the 3 States to be around 12,000 mating pair. Due to this healthy increase in numbers, serious conversation has begun about the possibility of removing this bird from the Endangered Species List. It would then be transferred onto the Threatened Species List, where these birds would still enjoy protected privileges. Considering the recent negative impact weather, man, and animals have had upon the wood stork, it's ability to rebound shows the bird's resilience. The fact that it's status is also likely to change from endangered to threatened proves that management of "at risk" species is a worthwhile project. It also gives us hope that other endangered species will recover with planned help and careful intervention.